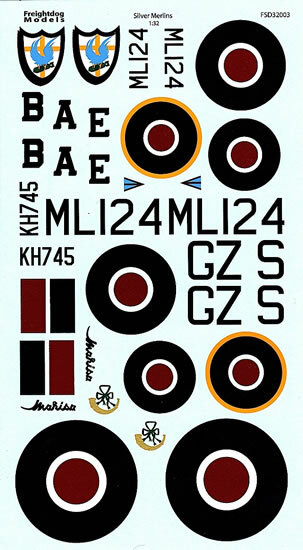 2 x waterslide decal sheets of national markings, code letters and other aircraft-specific markings; 1 x A4 full-colour double-sided instruction sheet for one Mustang Mk.IV and one Spitfire Mk.IXc. Highly recommended – two slightly out of the ordinary options for your Tamiya Spitfire and Mustang. 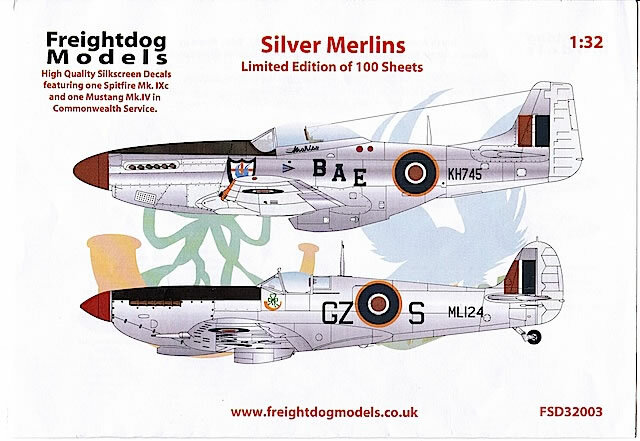 New decal releases from Freightdog Models are always worth investigating, especially if you are interested in late and post-World War 2 Commonwealth aircraft. While most Freightdog decals are 1/48 and 1/72, the company has made several notable 1/32 releases, including this latest set featuring a Mustang Mk.IV and a Spitfire Mk.IXc. Spitfire Mk.IXc, ML124/GZ-S of Pilot Officer Harry Shaw of 32 Squadron, RAF, Palestine, January 1947. This Spitfire had black codes and serials and was finished in High Speed Silver – apart from the replacement starboard wingtip, which was from a camouflaged aircraft and painted in the RAF’s temperate day scheme colours of Dark Green, Ocean Grey and Medium Sea Grey. This adds an interesting dash of colour to an already handsome aircraft; I’ve only been able to find one good photograph of ML124, but Freightdog appears to have accurately nailed its details. Again, the instruction sheet provides useful colour drawings and painting advice. My complaint about the detail on the Desert Air Force emblem notwithstanding, the overall quality of the decals appears to be excellent, with crisp printing and no sign of misregistration. No airframe stencils are provided, but these are readily available from other sources. I’ve bought several decal sheets from Freightdog in recent years, and can testify to both the quality of the decals themselves, and the excellent customer service offered by owner Colin Strachan. 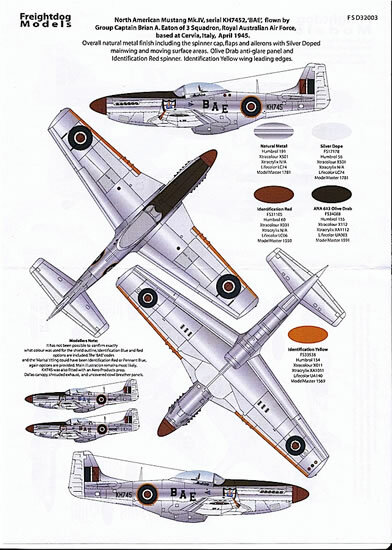 Earlier this year, a sheet of Freightdog’s Seafire decals I’d ordered went missing en route to Australia; an email to Colin solved the problem, with a replacement sheet arriving quickly and with no questions asked. I highly recommend this sheet to modelers who want to make their 1/32 Spitfires and Mustangs look just a little bit out of the ordinary. However, given that the sheet is a limited edition, if you’re interested in getting yourself a copy, you’ll need to hurry!